Under clear blue skies and breezy 68 degree temperatures, 23 workshop participants from 5 New England states put up 75 linear feet of a 4′ tall dry stone wall in less than 2 days at the Parmelee Farm here in Killingworth. Instructors Andrew Pighills, Dan Snow, Chuck Eblacker and Brian Fairfield worked side by side with students to impart their considerable cumulative knowledge of the art and science of building stone structures without mortar and seemed to have a good time doing it. From left to right, instructors Brian Fairfield, Andrew Pighills (background), Chuck Eblacker (in the lunkie) and Dan Snow. The dry stone walling workshop began at 9:00 am and Dan introduced a ‘stone circle’ exercise in which he asked each participant to select a stone that appealed to them and place it in a the circle that he’d etched in the ground. He then encouraged each member, instructors included, to comment on their selection and this provided a creative means to learn about the participants and their individual interests in and attraction to working with stone. 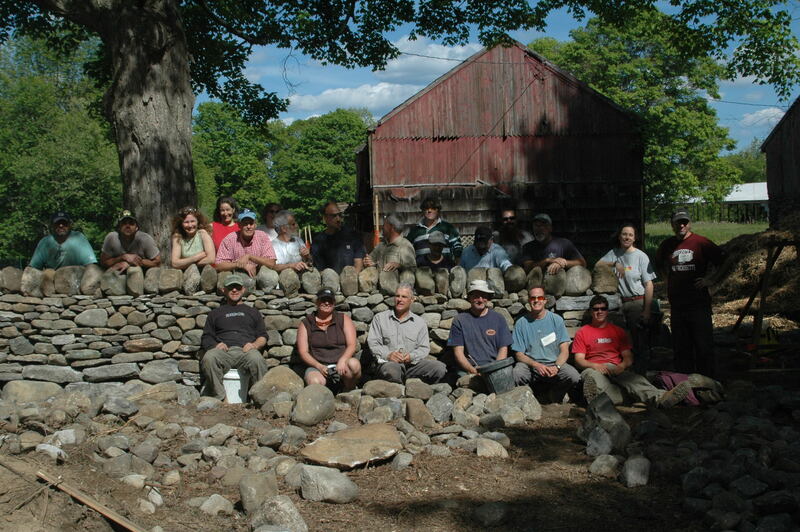 Participants comprised a very diverse group unified by a shared interest in working with one of New England’s most abundant natural resources; fieldstone, in one of our most traditional and agrarian activities, wall-building. Enthusiasm was contagious as future dry stone ‘wallers’ fanned out across the expanse of the gravel foundations and heaps of stone that Andrew, and assistant’s Eben Whitcomb III and Julia McCurdy, had prepared, and dove into the heavy lifting with such instinctual and intuitive purpose that one was reminded more of a colony of bees than a workshop. Within the time frame of 12 hours an astonishing 75′ of wall had been completed. The structure included two distinctly traditional farm wall features; a lunkie, (shown left under which Chuck Eblacker crouches) traditionally employed to permit sheep to pass from one pasture to another while restricting the meanderings of larger equine and bovine livestock, and a stile, a series of steps through a wall which enable a person to pass from one pasture to the next while restricting livestock in general. By 3:30 pm on Sunday, May 16th a jubilant and probably exhausted crowd of 30 broke into applause as the last capstone was laid on the newly restored Parmelee Farm wall. Bravo to all of you!! Well done!